The Hive Queen in February picked a really cute heart block. 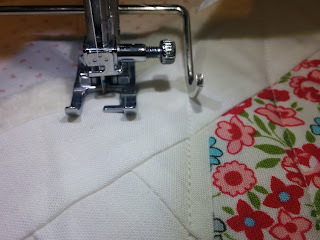 The tutorial was originally from Cluck Cluck Sew and can be found here. We made the 8" version. I liked it so much that I made 3 for the Queen, then made 4 for myself and turned them into a mini to hang on my front door. I knew I wouldn't get it done in time to hang for Valentine's Day, so I put the top away. 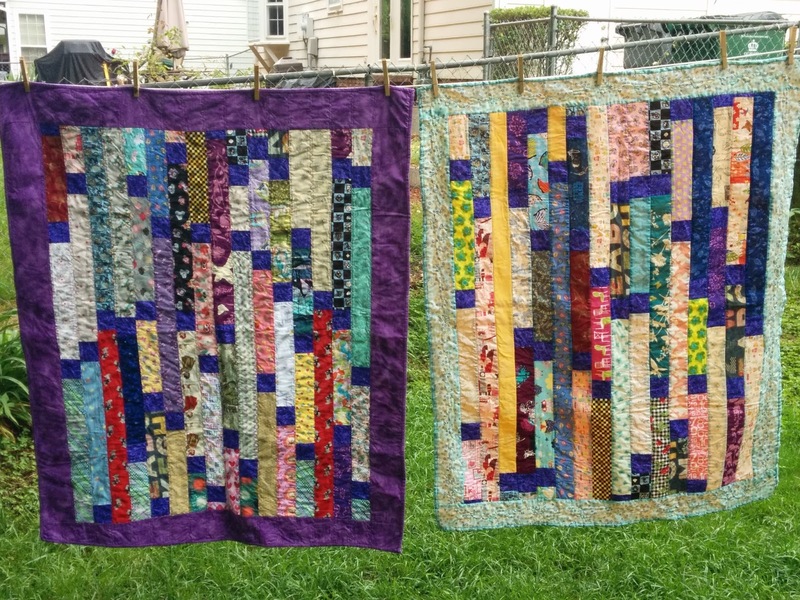 Heidi from Red Letter Quilts uses her fantastic One Monthly Goal link-up to finish projects that might not otherwise be at the forefront. I took a page from her book and made completing this mini my goal for May. 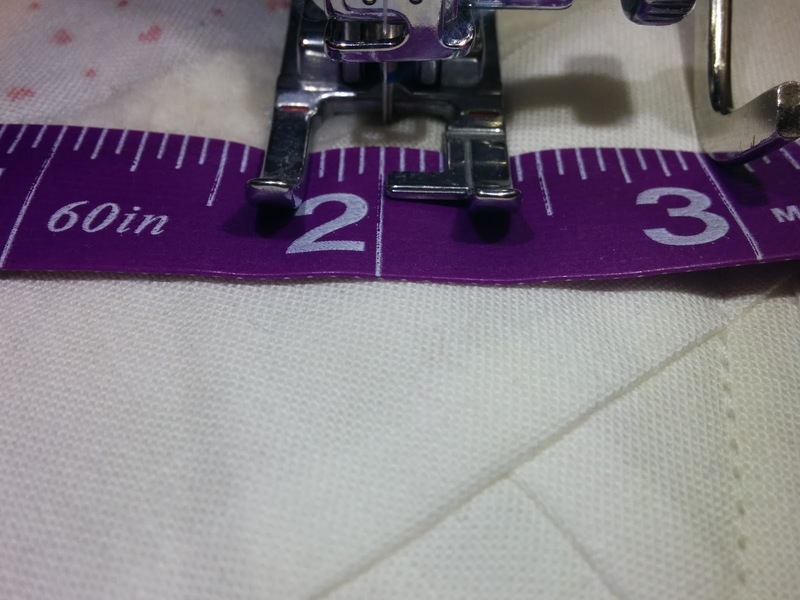 Then I placed the guide thingy on the last sewed line, and that kept my lines parallel. It meant watching the line and not the needle, which took a little bit of adjusting, but overall, I loved doing it this way. It is so much faster than marking every line! If I do a larger quilt with this technique, I will move the guide thingy to the other side of my needle. 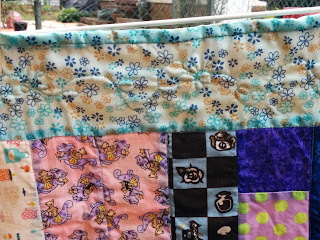 This is a small quilt, only about 17" square, so having the bulk of the quilt in my throat space was not a big deal, but it would be easier to flip to the other side of the needle for most projects. I don't usually go out of my way to match my backings to my tops, but I found this cute tiny heart print on sale and knew I had to use it for the back. This photo also shows how off-white Kona snow really is--it seems so white to me until I see it side by side with a bright white! This was on my list of Q2 goals for the finish along hosted by a group of global bloggers. I am also linking up with Heidi's OMG and Julie's Goodbye UFOs. 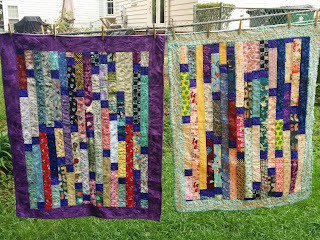 I've been using the Jelly Roll Race pattern when I have various lengths of 2 1/2 strips of I Spy fabrics leftover. In the process of making several, I've decided I don't actually like this pattern for using up scraps and I plan to try something different as my next batch builds up. In the meantime, though, I had this one in progress and it is now two quilts and both are finished! 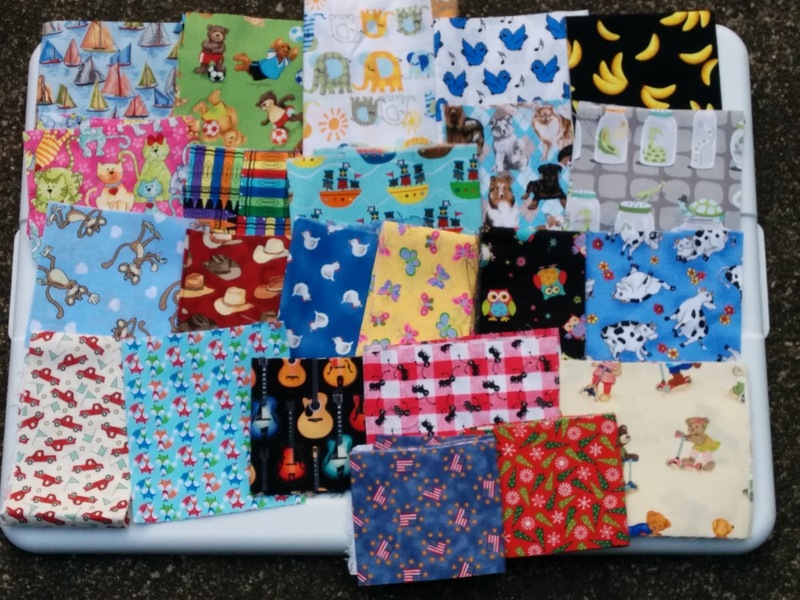 My friend Snow gave me a big bag of 2 1/2" strip scraps, most of them I Spy. I sorted them into two piles, mostly just separating out anything on the girly side and anything with several scraps of the same fabric. The first I finished at the end of last year, leaving the one with the girly-er fabrics. 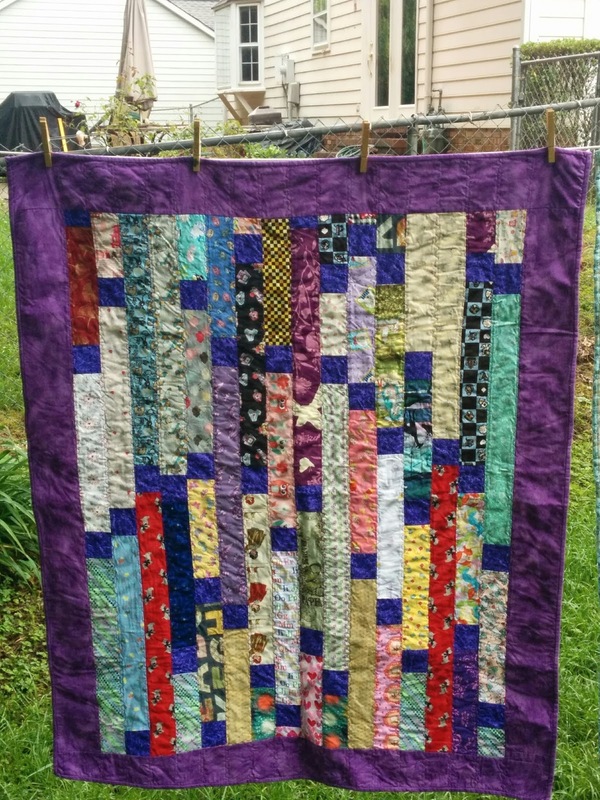 One of the things I don't like about the Jelly Roll Race pattern with scraps is that it is hard to get the finished size and proportions to work out. That was one of my issues with this one. I thought about just cutting off the last few rows and using that bit to start another one, but at that point the disorganized look of the JRR was getting to me (my second big issue with JRR) and I wanted to be done with it. So I ripped the center seam to turn this one into two quilts. They were a bit small, so I added borders. 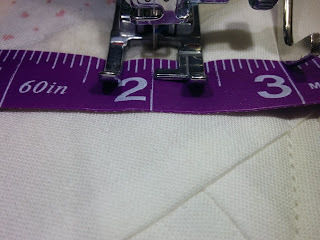 Since the fabric I used for the setting squares was purple and sparkly and also all used up, I found a nice purple in the donation pile at a Project Linus meeting and used that for one of the quilts. I used an aqua floral for the other, also a PL donation. I hated that floral fabric! I should have realized it wasn't 100% cotton and it frayed like crazy. I donated the leftovers back to PL, maybe someone else will have better luck with it! I did straight line quilting between the rows of the aqua floral quilt, then tried a free motion quilting design I've been doodling in hopes of mastering on the border. 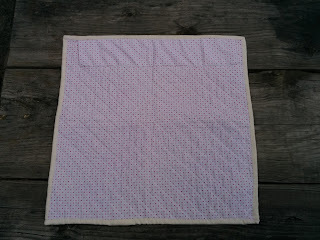 I'm not satisfied with how it looks and am still not sure that FMQ is something that I am going to master. 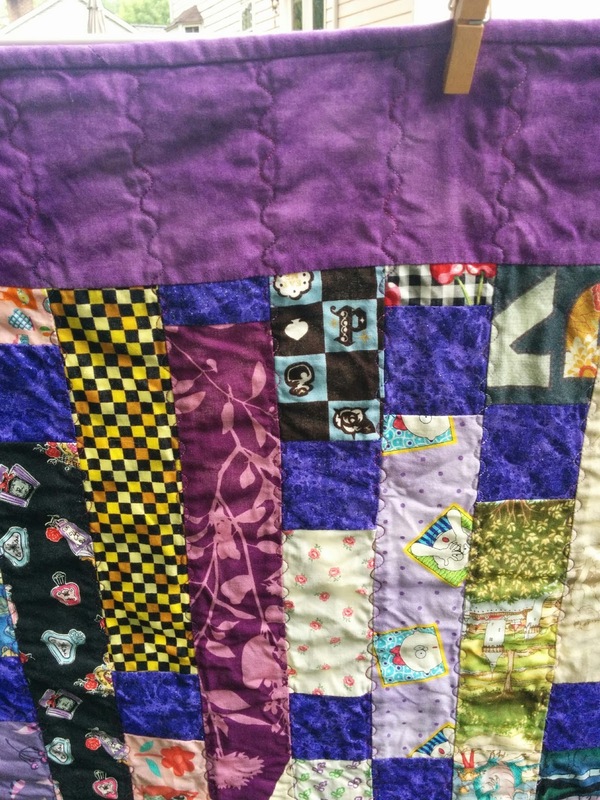 I'm much happier with the quilting on the purple quilt. 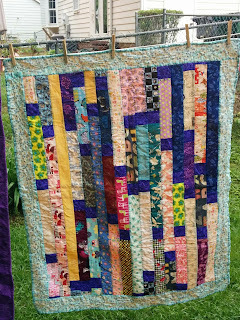 I used the wave stitch on my machine down the lengthwise rows, and used a variegated thread with purples and pinks in it. These two will be donated to the Charlotte chapter of Project Linus at our June meeting. This was project #10 on my list of Q2 goals for the finish along with global hosts. I've been active with the Charlotte chapter of Project Linus since the beginning of last year. I had been interested for a while, but the job change made it possible for me to actually attend the monthly meetings. I really enjoy it, and it's been nice to know that once a month I will get to talk to other quilters face-to-face. I've become particular friends with a member named Mary. We both bring our machines to the meetings and try to set up next to each other, and we have fun sharing photos of non-Linus projects. She has started doing some I Spy quilts, she says becuase she was inspired by me. Last night, she brought me a bag of her I Spy scraps! Here it is, and it's even tied with an I Spy scrap! 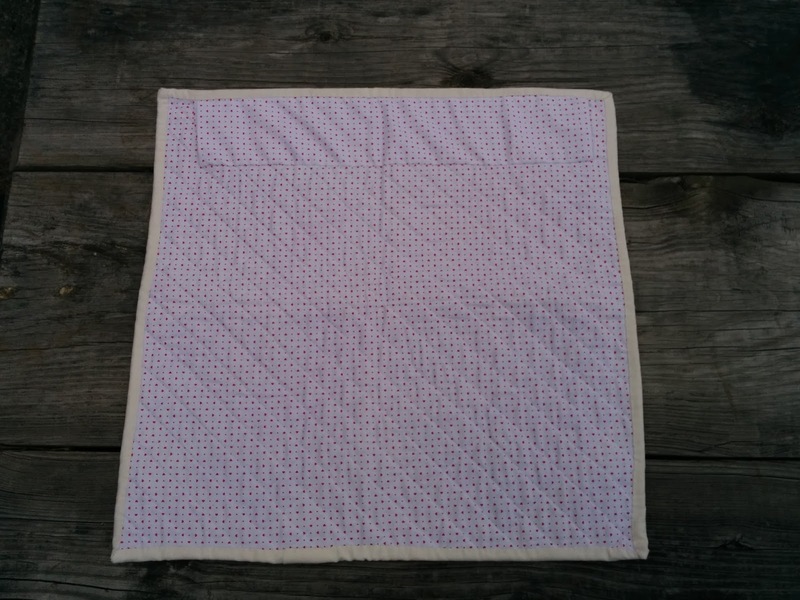 Her favorite pattern is disappearing 9-ptch with 5-inch squares. So I basically got all her scraps that were smaller than 5 inches square. Seriously, that is the best kind of present for me. Last night I went through the bag twice looking at all my treasures! Here are just some of the I Spy goodness she gave me! I cut my I Spy scraps into specific sizes to use in future projects, and I can't wait to cut these up and add to my piles! I'll be that much closer to being able to start another I Spy quilt, and those seem to be my absolute favorite. 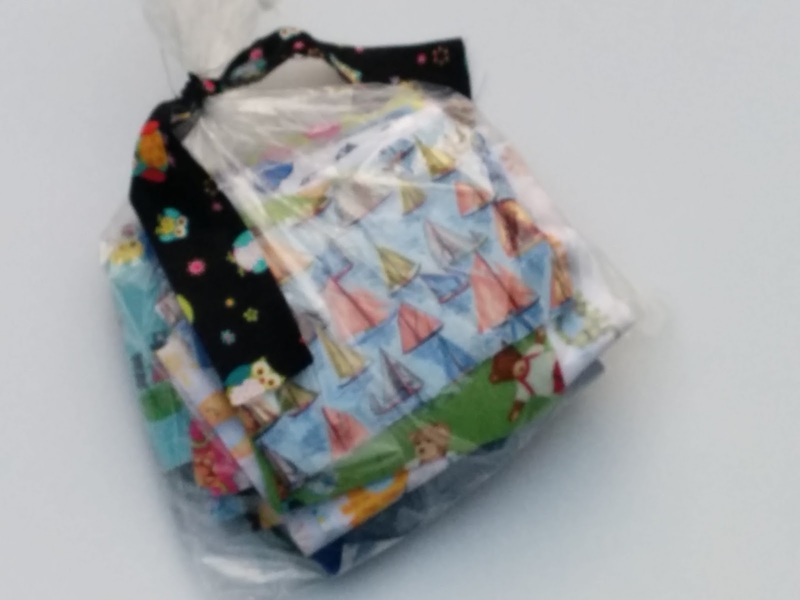 Her generosity is not the first I've experienced by a fellow quilter, nor do I think it will be the last. 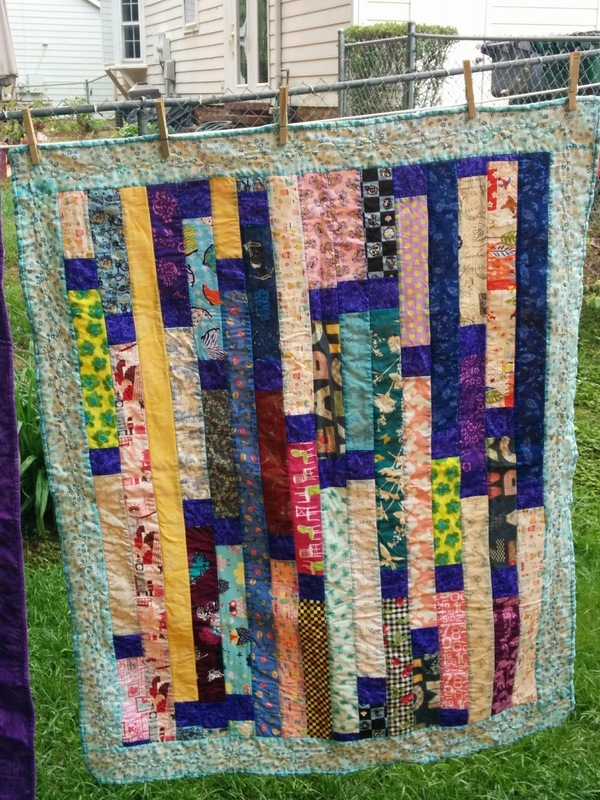 I am frequently struck by how generous quilters are--with their time, with their idea, with their talent, with their inspiration, with their support, with their guidance, and with their materials. And the list could go on. I certainly strive to embody that generosity as well, and I feel very lucky to be a part of the community of quilters, both online and in face-to-face relationships. I am thankful for my Quilty Friends! 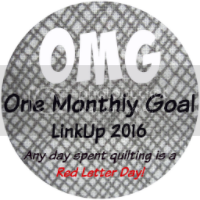 April was the first month that I did not complete my One Monthly Goal, the great motivator supported by Heidi at Red Letter Quilts. I have a few things that I hope to finish in May, but I'm going to pick an official goal that might otherwise fall off the radar. 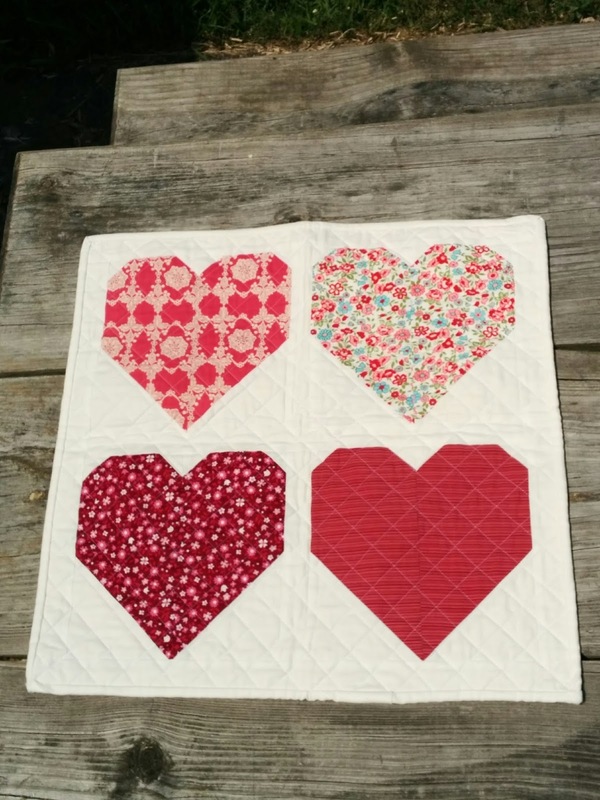 I really liked the heart block picked by my hive's queen in February for the Stash Bee. So much so that after I made 3 blocks for the queen, I made 4 for me and turned them into a mini! It's just a top right now, so my May goal is get it layered, quilted, and bound.